I liked the Hunger Games movies almost exactly as much as I liked the books they are based on; that is to say, just barely. The Hunger Games was a good introduction of a cool plot & character set, entertaining if you didn’t expect too much, but ultimately not the best novel or film. Catching Fire was the best book and best movie, but again, not perfection, only a step in the right direction. And then there’s Mockingjay, which would be split into two parts for the film franchise because, hey why not, there’s money to be made. Probably the weakest story, it’s not surprising that it produced the weakest of the movies and a drawing out of plot lines that had been played near to death by the time sweet release finally arrives. The Rebellion is drawing close to its completion, the Districts having aligned against the Capitol. With Katniss the Mockingjay as their fearless & figurative leader, the people won’t stand for oppression any longer, ready to rise up in force to declare a New World Order. But Katniss, the Hero of the Hunger Games, suddenly feels cast aside, worthless as anything other than a potential martyr. And with Peeta brainwashed by Snow & his minions, even love has been taken away from her, leaving her with nothing but her family & her anger. She can’t even trust the leaders of District 13, President Coin & Plutarch, puppet masters in a game that tosses lives aside with shocking ease. 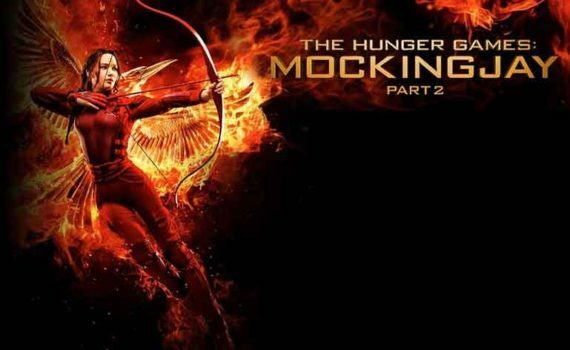 How will the story end, what will the Mockingjay do, and who will rise victorious? I fully expected this film to be a step up from Part 1, due mostly to the darkness of that film & its limited action. I wanted a return to Catching Fire and its cool characters, but while many of them did return, it was as a shell of their former selves, just pieces in a big muddled puzzle that made me glad the series was finally over. It was past time; no more “propos”, no more Snow’s rose, no more Peeta vs Gale, no more bitter Haymitch, and no more confused Kat. It was time to end it, and end it they did, but not before one final grasp as success. Sadly, they reached too far. The action was silly, looked bad, and seemed recycled. The emotion was flat & unbelievable, leaving me feeling jaded rather than inspired. And ultimately, I was glad to be done with the books, the films, the characters, everything, ready to leave it all behind as an enjoyable way to waste some time, but not too much else.